It’s Christmas Eve. Santa has changed the frequency on his GPS from monitoring the lives of everyone to calculate his route as he travels around sneaking into people’s houses, scarfing down milk and cookies, leaving some toys that will be broken before he gets back to the North Pole, and replacing the batteries on all the spy equipment he installed last year. How else does he know who to put on which list? Since I don’t think Santa visits grown up Jewish men (or if he does, he hasn’t found me in more than a few decades,) I don’t have to worry about his lists. The government lists are a different story, but at my age, if I don’t have an FBI file by now, my life has been a complete failure. Today was one of those glorious Pacific Northwest days – beautiful blue skies, warm enough to be comfortable in a lightweight jacket. No concerns about snow, rain storms, or power outages. Good visibility for the reindeer. Have you ever stopped to think about reindeer pulling a flying sled? What a strange image. Appropriate for the far north, but elsewhere in the world? And what about the tropics? What iconic deliverymen do they have in their mythology? Heavy coats, sleds, even reindeer are not ubiquitous in the hot climes. I have been thinking about the crass commercialism of this holiday season. Toys, clothes, household appliances, perfume, and expensive cars are some of the items being incessantly hawked on television these days. Buy! Buy! Buy! That seems to be the message of the season. And it fits with the American religious (spiritual beliefs of consumerism and capitalism. However, what I want to talk about is light and love. That’s the real spirit of the season, the message of the holidays. In the Northern Hemisphere, this is a time of darkness; the solstice was four days ago and so each day brings minutes more of light. Yet, we need to manufacture light to guide us, to illuminate our lives, to keep away the dangers we perceive lurk in the night. And so, we have holidays of light – Hanukkah with its historical story of the resurrection of the Temple and the day’s worth of sanctified oil that miraculously burned for eight days. We have the lights of Christmas, on trees, the Yule log, house decorations. Kwanzaa uses seven candles to illuminate the night and commemorate its traditions. During the holiday of Diwali, Hindus Diwali, along with some Sikhs, Buddhists and Jains, celebrate Rama’s victorious return home by lighting candles. And of course, the winter solstice, however, it is celebrated, marks a scientific turn toward the light, as days begin to grow in length as we move toward Spring and Summer. I gathered with members of my Circle of Caring on Monday, the day after the Solstice, to participate in our annual ritual. 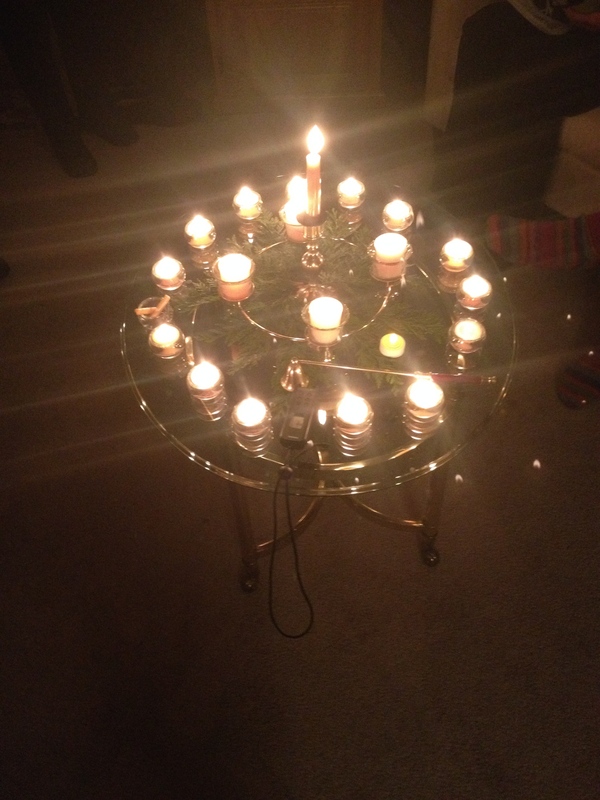 Poems were read, songs sung, candles lit, intentions spoken aloud following moments of silent meditation. We honored the darkness and welcomed the gradual return of light, safe and secure among trusted and loved friends. That, to me, is the true meaning of the season. So, whatever you are celebrating this December, in whatever way you choose to do so, I wish you great joy. May the Season and the New Year bring you and yours a time of health and happiness, peace and love, the actualization of fantasies and the realization of dreams. ← Happy Birthday to . . . ME! I, too, have been puzzling over how Southerners celebrate Christmas traditions that I am so acclimated to. I was amazed to discover that my friends in Australia and South Africa take their young children around the neighborhoods to see the Christmas lights at sunset…after the kids’ usual bedtime…in their t shirts and shorts. European culture continues to override sensibility.